Sometimes a deal is just so good, you’ve just gotta take it. Australia’s announcement that it will buy the the UK’s soon-to-be-redundant LHD Largs Bay for $100 million Australian dollars (@$105 USD at present rates) must have government minsters in a gleeful state. Even if the Largs Bay has serious problems, at this price, it’s a steal. Anybody involved in negotiating this deal should be congratulated. Considering that initial stories were suggesting that the Aussies might end up paying $300 million ASD for the Largs Bay, the low price-tag is great news. Small-to-mid-sized amphibs are meant to be used for lesser contingencies–not seconded to the two flatdecks. Second, Australia is underestimating future demand for smaller amphibious platforms. One is not enough. Over the coming years–after the two Canberras enter service by around 2015–there will be, quite simply, too few “mid-sized” amphibious platforms readily available in Australia to fully address the ever-expanding (and ever-more complex) array of complex South Sea security threats. Sending a Canberra platform to help squelch every outbreak of political upheaval is far too costly for such missions. Not only is the Canberra Class an over-match for most peace-keeping missions in the South Seas, no Canberra Class vessel will travel anywhere alone, ever. Ginning up a task force for a dash deployment costs an enormous amount of money. And it can’t be done quickly, either. What Australia really needs is some sort of fast-moving, small-force insertion “utility” trucks–ships that can get from one place to another rather quickly. Platforms that can be used to deploy police forces or other support personnel in low-threat environments–civil disruptions, disasters and the like. Keep the Canberra Class vessels for the big “out of area” stuff. AUSTRALIA may use a civilian transport ship to plug a gap in the Navy’s amphibious capability, despite the announcement yesterday that Defence will pay the Royal Navy $100 million for an amphibious ship. Tasmanian boat builder Incat confirmed it was in talks with the Defence Department over the sale or lease of a 112-metre catamaran to tide the Navy over until 2015 when two huge new landing helicopter docks will be operational. A good mix of high and low assets, all matched by the shared ability to carry/support the central components of the Australian amphibious armory–CH-47s in particular–makes sense. And with the price they’re paying for the Largs Bay, the Aussies now have no excuse to at least retire the old stuff, and then rent and experiment with a few new platforms. 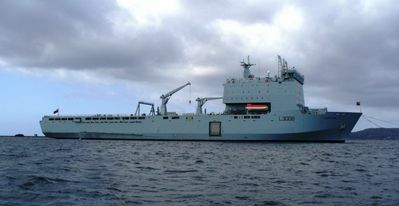 Chartering (not really leases) ships to provide stopgap sealift has been dones for decades now by the USN and RN as well as others. Australia is fortunate to have two HSV builders with designs available to fill the need and of course they had the first experience with those in HMAS Jervis Bay.